Do you wish to replace the whole bathroom or just certain parts? What would you like to keep and what parts really need replacing? Who will be using the bathroom? as different age groups have different needs. For young families, a bath is a good option, but for older users, a step-free shower or even a wet room may be more practical. What style of a bathroom are you looking for? A contemporary modern style or something more in keeping with the age of your property: -Victorian, Edwardian etc and what colour scheme would you like. What is the budget available for all the work? As it may be more cost effective to buy your bathroom suite as a package than single items. It may be a good idea to draw a plan of your bathroom even if it is a rough sketch, this will give you an idea of what you would like and where. Obviously, it will be easier and more cost effective to use existing plumbing, so consider this in your planning. You will need to take lots of measurements of the room and the new fittings you wish to add to ensure everything will fit. Let's work from the flooring upwards, so firstly a bathroom floor needs to be water resistant for the humidity and splashes likely to occur. Good choices are luxury vinyl tiles, bathroom laminate flooring or ceramic tiling. Whichever you choose, look for a product that has texture and therefore more grip which will help avoid slipping. It may be possible before installing your flooring to add underfloor heating. This can make a world of difference in a bathroom on chilly mornings, it can be set up as part of your central heating system and then can be programmed to fit your daily needs. 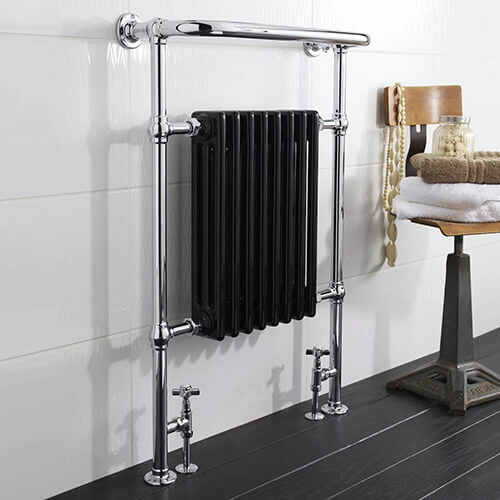 As well as underfloor heating, another way to add warmth to your bathroom is to add a towel radiator, so you have somewhere to warm and air your towels as well. These are available in many shapes and sizes so there will be one to fit even the smallest bathroom. 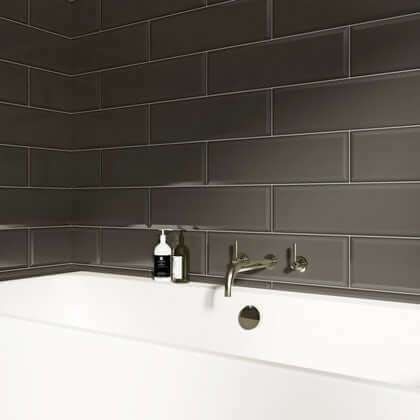 Your bathroom walls can be constructed from many things nowadays:- traditional tiles, plastic sheeting, acrylic panels, laminate panels, stone or glass. All of these are waterproof which is very important, you just need to finish off with a good waterproof sealant to prevent any water ingress under the panels. Next, let's look at the bathroom suite;- you may decide to buy a whole new suite or just the parts that need renewing. It may be more cost effective, however, to purchase the whole suite and it saves you having to choose all the necessary parts separately. 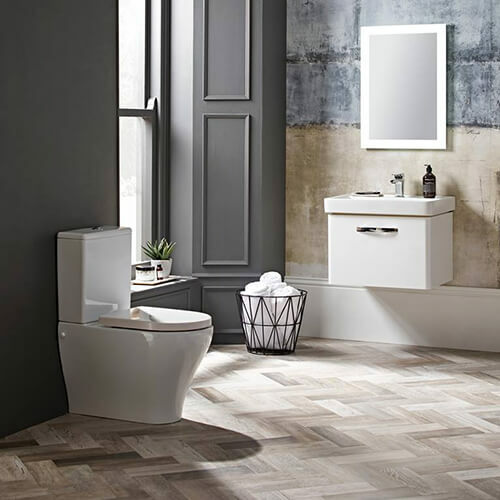 The bathroom suite traditionally consists of a bath, toilet and basin, but there are variations on these, you just need to decide what style you are looking for ie classic or more modern. 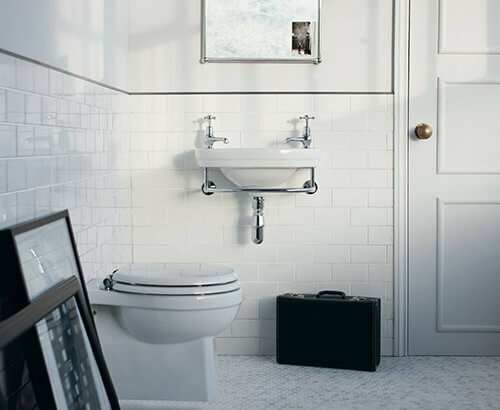 As most bathrooms tend to be small, something they often lack is storage space. So when choosing your new suite look for added storage areas. 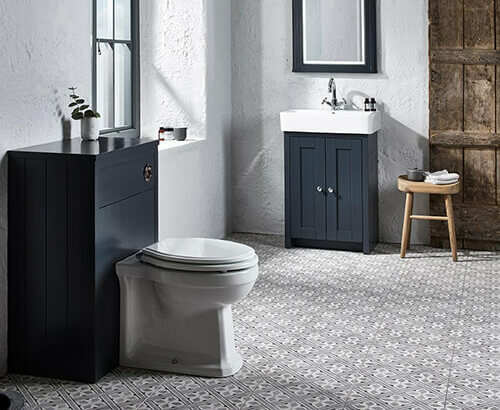 Most modern toilet units are made to hide the cistern and any pipework from view, this also means there will often be a cupboard or two just right for hiding the toilet rolls and a few cleaning products. Once there is more storage available, the less cluttered the bathroom will be, making it easier to keep clean and looking smart. Other furniture options include column units which are tall and slim so will fit in neatly to add even more shelves and drawers for storage. Basin units and vanity units also have plenty of storage areas underneath the basin and often behind the mirror at the top, all of these are really useful for popping all the family's toiletries and healthcare products away tidily. Consider adding a double basin unit if there is space to do so, as these are becoming extremely popular with couples having his and her's spaces, but equally would work well for a family. There are many styles of taps you could choose from for your bath and basin, some taps even have built-in soap dispensers, which is hygienic and gives you less basin clutter. 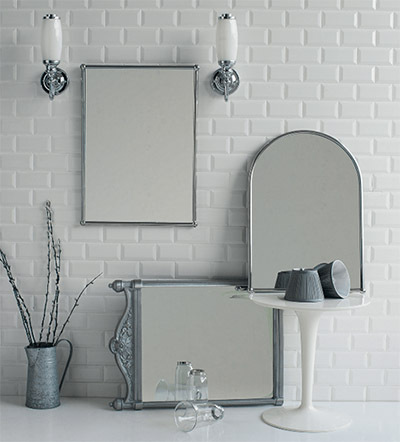 Mirrors in a bathroom are an obvious choice, but they will also add light and a feeling of spaciousness. Mirrors with built-in lighting are even more useful for applying make-up etc. 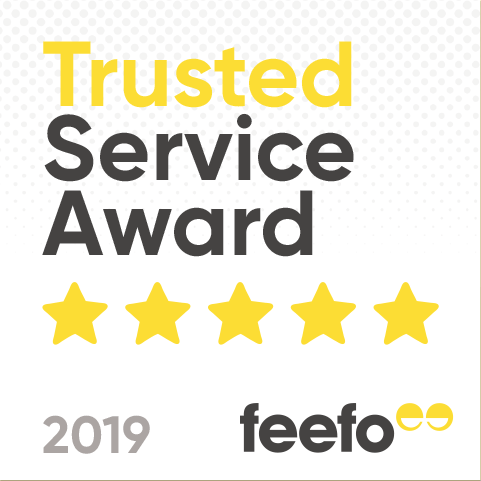 There are many styles of baths to choose from, roll top freestanding baths are very popular as are the classic straight baths with fitted bath panel to hide pipework and plumbing. Baths with curved ends are great if you need to incorporate a shower at one end as it gives a little more space to comfortably stand in. 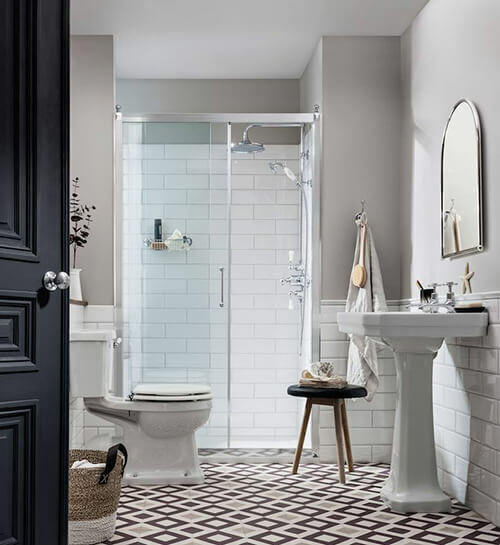 The size of your bathroom will then determine whether you have space for a bath and a separate shower cubicle, or maybe a shower fitted that can be used over the bath, with a shower screen to stop splashing. This will be a personal choice as well as many people have a preference for showering or bathing. A family bathroom is often better with a bath for bathing smaller children, and with a shower attachment added to use for hair washing and showering, you have the best of both worlds. 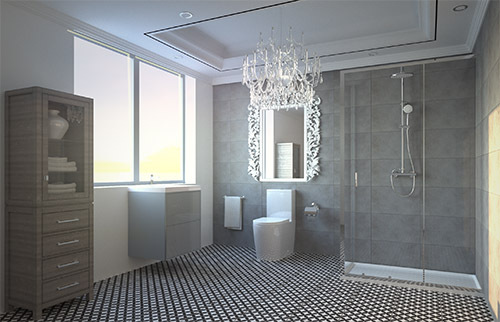 For older persons or anyone with limited mobility a shower with step-free access or even a wet room will be ideal, however, these are becoming popular for everyone due to their stylish look and ease of access. This style of shower room is now seen as luxurious and is moving away from its beginnings as a practical option and is now often found in the best chic hotels. If you have an unlimited budget for your new bathroom there are all sorts of luxurious items you can add to your bathroom from sound systems, smart showers with digital controls or even a sauna or steam room if you have space.